The Breast Cancer High Risk Program at SUNY Upstate offers advanced, comprehensive, personalized breast cancer surveillance and prevention for individuals who are at increased risk of developing breast cancer. The Breast Care High Risk Program is directed by Jayne Charlamb, MD, FACP. Dr. Charlamb specializes in benign breast disease and breast cancer risk management and has been at Upstate's Breast Care Center since 2000. She is Board Certified in Internal Medicine, giving her a thorough understanding of the diagnosis, treatment and compassionate care of adults across the spectrum from health to complex illness. Importantly, the High Risk Program Team also includes multiple highly experienced Nurse Practitioners who have special training in breast cancer treatment and surveillance. The High Risk Program partners with multiple specialists at Upstate to provide patients with ready, rapid access to a broad range of breast cancer screening, diagnostic and treatment services whenever they are necessary. Specialists include breast surgeons, medical oncologists, radiation oncologists, radiologists and genetic counselors. Through open communication and education, team members of the High Risk Program become health partners with women at increased risk for breast cancer, empowering them to live with reduced risk, less fear and more knowledge. 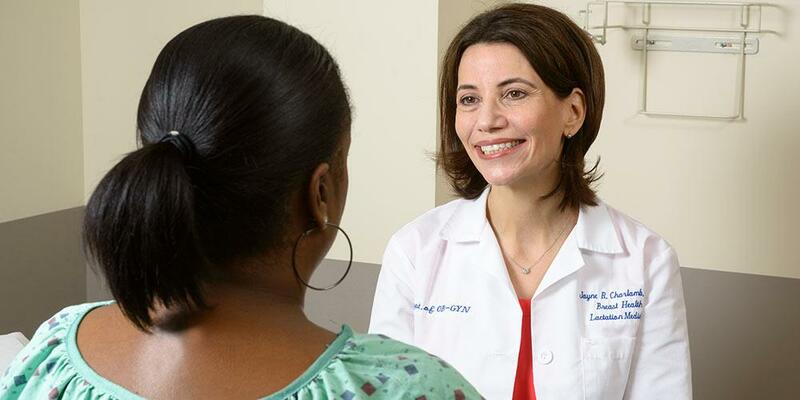 At your first visit, a physician who specializes in breast cancer risk and prevention will meet with you, take a complete history and perform a breast exam. You and the physician will then discuss your risk of developing breast cancer and your options for managing this risk. Together, you will design a personalized program of breast cancer screening and prevention. As part of your High Risk Program visit, your physician will discuss how these factors affect your individual risk and will give you an estimate of your personal risk of developing breast cancer in the near future and over your lifetime. The Breast Cancer High Risk Program partners with Women’s Imaging Services, conveniently located within the same office suite at 550 Harrison Center. Our multidisciplinary team of breast cancer specialists combines the latest medical and scientific knowledge with the most advanced surveillance and diagnostic methods, including Digital Mammography, Breast Tomosynthesis, Breast Ultrasound and Breast MRI. If any radiology studies are recommended, they will be ordered on the same day as the visit. Some tests may be performed on the same day, and others may need to be scheduled on a different day depending on the availability of the study and the need for the insurance authorization. Lifestyle choices: Regular exercise, maintaining a healthy weight and limiting alcohol and breastfeeding are key prevention strategies. Other dietary and reproductive factors can also play an important role. Medications: Multiple medications are now available to reduce a high risk woman’s risk of developing breast cancer. These include tamoxifen, raloxifene and various aromatase inhibitors. Surgery: This is most radical approach a woman may take to reduce her risk for breast cancer. While surgery is not the right choice for every woman at high risk, it can be an effective way to significantly reduce breast cancer risk. Options may include breast removal (prophylactic mastectomy) and ovary removal (prophylactic oophorectomy). Routine follow-up appointments are typically arranged every 3 to 12 months, depending on your risk. Follow-up visits include a review of your risk management options, a clinical breast exam and appropriate breast imaging. Most routine follow-up appointments are scheduled with a Nurse Practitioner who has special training in breast cancer surveillance and prevention, and who will remain in close communication with your physician provider. You will be referred back to your physician breast specialist immediately should any questions or concerns regarding your breast health arise. As a patient in the Breast Cancer High Risk Program, you may have the opportunity to participate clinical research studies to take advantage of the most recent high risk management options available, and to help advance the understanding of breast cancer risk and prevention. Please note that volunteering for such a study is entirely optional and that you may cease to participate at any time. Last Modified: March 19, 2018. Contact Rebecca Bellini with questions about the content of this page.